Constellation Brands Inc. is strengthening its ties with Canopy Growth Corp. with an agreement that will see the alcohol producer take a nearly-40 per cent stake in Canada's largest licensed cannabis producer. Under the terms of the agreement announced early Wednesday, New York-based Constellation (STZ.N) will pick up 104.5 million Canopy (WEED.TO) shares for $48.60 each. 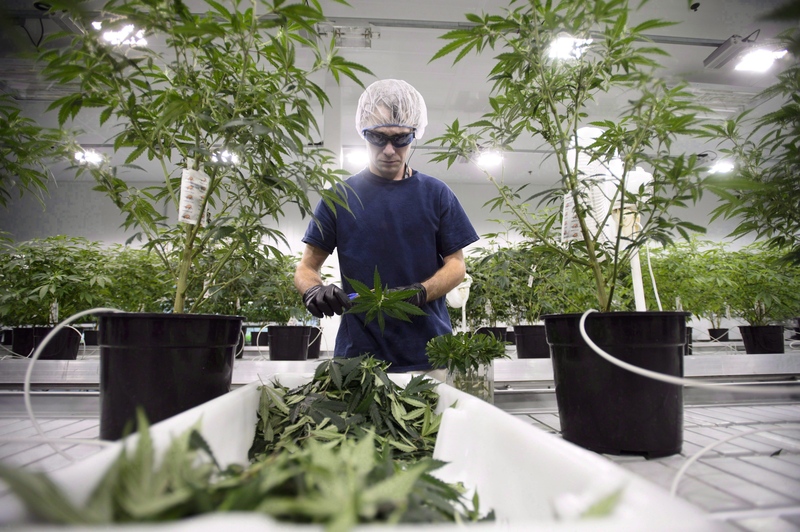 The move follows Constellation's deal in October 2017 that saw the alcohol producer invest $245-million in the Smiths Falls, Ont.-based pot producer. All told, once Constellation exercises its warrants, it will end up with a 38 per cent ownership stake in Canopy. And it’s laying the groundwork to grow that stake by picking up an additional 139.7 million share warrants that could ultimately push Constellation’s ownership interest above 50 per cent. Canopy’s stock soared 31.26 per cent on Wednesday, to close more than $10 higher at $42.20. "Through this investment, we are selecting Canopy Growth as our exclusive global cannabis partner," said Constellation CEO Rob Sands in a release. "Over the past year, we've come to better understand the cannabis market, the tremendous growth opportunity it presents, and Canopy's market-leading capabilities in this space," he added. "We look forward to supporting Canopy as they extend their recognized global leadership position in the medical and recreational cannabis space." Bruce Linton, founder of Canopy Growth Corporation and co-founder of Tweed Marijuana talks about the Ontario government's newly announced cannabis plans to move away from the public retail model to a completely private system. The deal also allows for Constellation to nominate four directors to Canopy’s board of directors. The new shares Constellation is acquiring will result in more than $5 billion in proceeds for Canopy, which the company says will go toward strategic growth opportunities and help set it up to capitalize on new recreational markets. "Our business can now make the strategic investments required to accelerate our market position globally," Canopy CEO Bruce Linton said in a release. The Ministry of Innovation, Science and Economic Development could not say for sure if a boosted Constellation stake in Canopy would be subject to the Investment Canada Act. “As is standard practice, when a significant transaction is announced, Innovation, Science and Economic Development is looking into how the Investment Canada Act may apply to this proposed investment,” a ministry spokesperson told BNN Bloomberg via email. Editor's note: An earlier version of this story included inaccurate information about the number of new Canopy warrants that Constellation will receive. BNN Bloomberg regrets the error. Does Constellation’s deal with Canopy change your view of pot stocks?